Ben is responsible for designing and guiding the company’s product roadmap and representing Nextek on several key national forums. Ben is an electrical engineer with 20 years experience in technology and management consulting. For the EMerge AllianceTM, Ben is the Chair of the Technical Standard Working Group and has guided representatives from the member companies to author the recently completed standard. 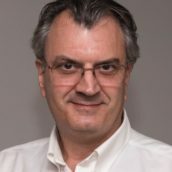 A graduate of Tufts University and Columbia Business School, he has developed proprietary controls and precision devices for Technicon Inc., performed Telecom and Media strategic consulting for Booz Allen & Hamilton as well as corporate strategy and new business development for SNET (now AT&T). Ben developed one of the company’s key patents for the bi-directional version of their flagship product.